Come along and experience the amazing changes that Alaska goes through as the summer season progresses. It’s all about the return of the spawning salmon from the ocean to the rivers and lakes. This major event is to be witnessed and experienced in person. And for any wildlife or fishing enthusiast, whether you want to view the brown bears up close and personal, fancy some bird watching or even catch a salmon, char or trout – the adventures are waiting to be experienced. Experience Crystal Creek Lodge: Operated by the same owner/manager who began as a Crystal Creek Lodge guide in 1988, associated with Orvis as an Endorsed Lodge since 1991 and twice awarded Orvis-Endorsed Fly Fishing Lodge of the Year and 2015 finalist, Crystal Creek Lodge offers guests a unique combination of field and stream diversity, the highest guide, staff and aircraft to guest ratios available in Alaska and inspired lodging and hospitality. The surrounding Bristol Bay Region and Alaska Peninsula inarguably offer the most diverse and productive freshwater fishing opportunities on earth. Mix your fishing trip with spectacular wildlife viewing and adventure activities in nearby National Parks and Wildlife Refuges. Compare offerings and decide for yourself if Crystal Creek Lodge offers the most comprehensive guided fishing and lodging packages available in Alaska, if not anywhere. 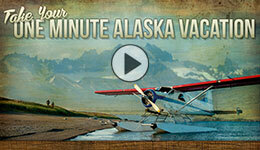 Crystal Creek Lodge specializes in making your Alaska fishing and adventure trip – a dream come true.